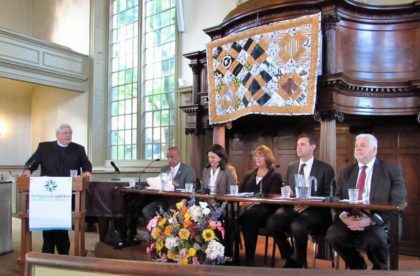 First Unitarian is a member of the Religious Coalition for a Violence-Free Rhode Island. This major legislative-focused social justice coalition is committed to changing the conversation about gun violence in Rhode Island and facilitating the removing guns from households with a record of domestic violence. The leadership group of the coalition includes Rev. Gene Dyszlewski, one of our community ministers. The coalition recently advocated for two legislative issues: the domestic violence gun bill and the Criminal Justice Reinvestment Program. The domestic violence bill impacts all Rhode Island communities. The Criminal Justice Reform Program disproportionately impacts the way policing is conducted and sentencing is applied in minority communities. First Unitarian hosted a Memorial Vigil on the anniversary of the Sandy Hook shootings last winter, the second memorial service held at First Unitarian. During the service, a memorial quilt made from clothing of RI gun victims was presented and displayed. 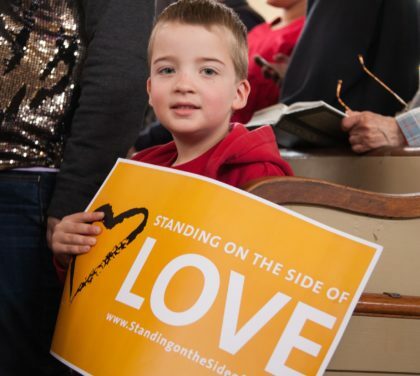 First Unitarian stands on the side of love with all families, regardless of citizenship status, and strives to create a welcoming community for all. We advocate for immigration reform, for an end to detentions and deportations, and for a world where no one feels forced to leave home or risk death in pursuit of a decent life for their family. Upholding our Unitarian Universalist Principles, First Unitarian publicly dedicated a sanctuary space in our church to provide refuge for a family in fear of deportation. 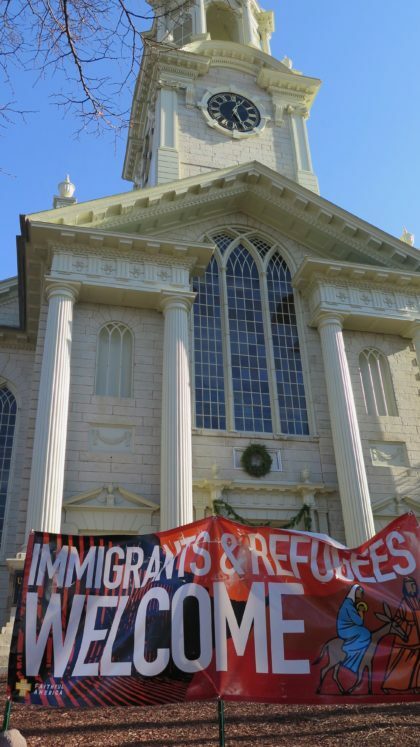 In collaboration with local agencies — including Dorcas International, Rhode Island State Council of Churches, Fuerza Laboral, Providence Immigrant Rights coalition, the Unitarian Universalist Service Committee, and UU churches in Massachusetts and Colorado — we are dedicated to putting our words and beliefs into action. The work of providing a place of sanctuary for persons who are in immediate danger of being deported is ongoing, and the opportunities for people to participate are many. Throughout the year there will be training for those who wish to learn more about the role of a sanctuary host as well as opportunities to fill other important needs as our implementation of sanctuary continues and deepens. To learn more, click here. Every person has value as a member of the human family. The suffering caused by racism must be ended if we want to create fair and loving communities. First Unitarian is working to end racial discrimination and injustice, starting within ourselves and moving out into the world around us. We support stopping racist policies like mass imprisonment and attacks on voting rights. Our efforts will continue until there is peace, liberty, and justice for all. We are committed to taking action to dismantle racism and white supremacy in our communities and to promoting justice. 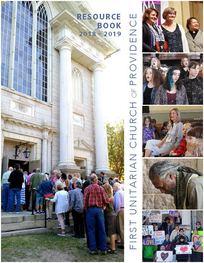 First Unitarian is a member of the UU Legislative Ministry-RI, the state-wide organization involved in social and economic justice causes in the RI General Assembly and the US Congress. It is one of 10 UU Legislative Ministries that serves as a visible force in the “public square,” as guided by our UU principles. UU Legislative Ministry-RI is an advocate for justice and peace. Activities include letter writing campaigns, participating in rallies and marches, meeting with local legislators, and lobbying at the Rhode Island General Assembly. You can find out more about UULM-RI by clicking here. There is much to do. We invite you to join us and devote a few hours to advocating for social and economic justice. The Unitarian Universalist Service Committee advances human rights through grassroots collaboration. In more than a dozen countries throughout the world, UUSC fosters social justice and works toward a world free from oppression. 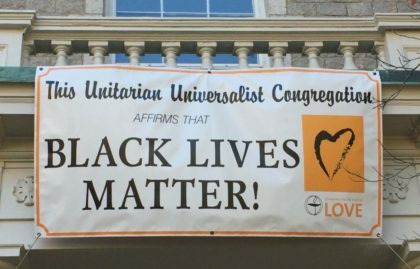 First Unitarian supports the UUSC and participates in its programs including the annual Guest At Your Table project and the College of Social Justice. 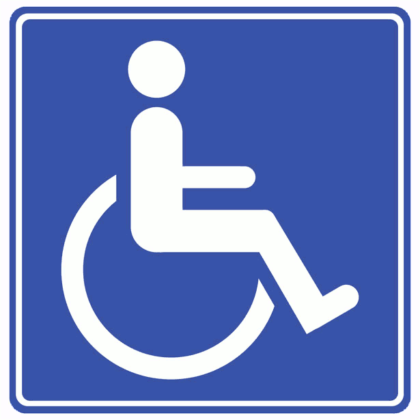 Guest at Your Table supports human rights work around the world. This year’s program theme is Small Change is Big Change. Guests include a leader of local efforts to respond to climate change in the South Pacific and a Burmese human rights activist. The UUSC’s College of Social Justice offers experiential learning to inspire and sustain social justice engagement. They organize service learning trips for youth. Creating a sustainable way of life is central to our view of a just and compassionate world. We invite all who share these values to join us on this journey of connection, sustainability, and hope. Get involved in our broad and growing movement for climate justice.